"Granddad Brady and the Old Yellow High Chair"
Oh no, it wasn’t always yellow, it has been many colors and has served many children within our families. 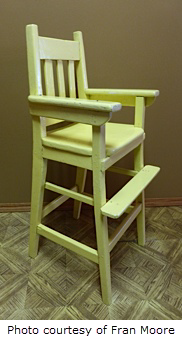 It all started back in 1938 with my Great Grandfather, Thomas Brady, who built a high chair for the expected child, me. At the time we lived with my Grandfather Stenseth, north of Valleyview, or with my grandparents Ben and Lutie Bodeker, east of Valleyview. We did not have our own homestead yet. copies of pictures that he liked. I prize these pieces; especially the ones that are all flyspecked from hanging on the cupboard door of his little cabin. They decorated his walls. Another piece of his work is a prized possession of Nita Clough at Valleyview. It is a rocking chair that Granddad Brady made for Sandy Ford, who then gave it to Nita. In 1940, when sister Phyl was a small baby we moved to our own homestead south and west of Valleyview. Dad had built a two-room home in a clearing on the west side of the quarter. It was a short walk through the trees, past the outhouse to our garden and our pastures. By then Grannie and Grandpa Bodeker had moved away so Granddad Brady came to live on our homestead in a little log cabin. Phyl and I spent quite a bit of time with him when our Dad was away working and Mom had to do the farm chores. He taught us much about “behaving and manners”. Phyl remembers him teaching her how to hold her fork, and she had to do it right. Being as I was the oldest I was away to school first so Phyl spent even more time with Granddad Brady. I remember him as being a small man and very stern and strict. In his little cabin, I remember him having a cupboard and table, a bed and a stove and other possessions stacked in the corner. Outside was a good-sized woodpile, which we remember, was one of his major activities, besides babysitting us girls – splitting wood. Also, to the west of his cabin was the root cellar, next to our big garden spot. This was a wonderful structure that kept our vegetables fresh all year round.